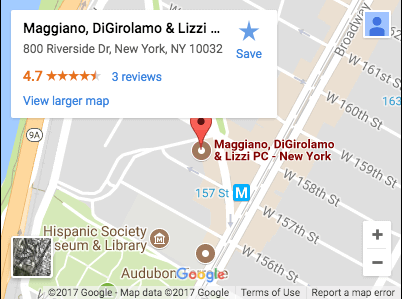 Hoboken, NJ Personal Injury Lawyer | Maggiano, DiGirolamo & Lizzi, P.C. In seconds, an accident can inflict permanent, life-altering injuries. These can cause a lifetime of physical, emotional and financial stress for the victims, as well as their families. The Hoboken lawyers at Maggiano, DiGirolamo & Lizzi, P.C. have a deep understanding of how damaging these accidents and personal injuries can be. We also know how essential the right legal representation can be to helping victims and families recover and put their lives back together. Consequently, we are firmly committed to helping the injured fight for the financial recoveries and justice they are entitled to. In a free, no obligations case evaluation, you can get essential answers and straightforward advice about your legal options and how we can help you. Don’t hesitate to contact us whenever you are ready for these insights. In the meantime, the following discloses some generally important information about personal injury cases and recoveries. What Types Of Events or Accidents Are Typically the Basis of Personal Injury Cases? Injuries caused by negligent professionals, including medical malpractice. Fundamentally, any incident that was caused by another’s negligence and that inflicted harm on you may be the basis of a personal injury claim. The claim is filed with the court. Further investigation and discovery may be conducted to gather evidence for the claim. Pre-trial hearings and/or negotiations may take place. A trial date is set, and the case proceeds to trial (if a settlement cannot be worked out beforehand). A Hoboken attorney at Maggiano, DiGirolamo & Lizzi, P.C. can give you more details regarding what to expect from your case, after reviewing the facts of your potential claim. The injuries and/or damage is more extensive (and may take time to fully assess). The cases are more complex (because, for example, there are multiple liable parties and/or plaintiffs). There may be evidentiary problems or conflicting evidence. The cases involve more technical, complicated issues (like in some product liability and/or medical malpractice claims). What Is the Difference between Compensatory versus Punitive Damages? Compensatory damages are granted to restore the losses victims have suffered as a result of the accident or injury. As a result, these damages can include compensation for past and future medical bills, past and future lost earnings, property damage, etc. Punitive damages are reserved for cases that involve extreme, egregious forms of negligence. Awarded to punish a negligent party (and not necessarily to restore the victim), punitive damages can be capped by state law, and they are not available for every type of personal injury claim. Securing the financial means necessary to heal and move forward. For more information about your legal options, contact an experienced Hoboken personal injury lawyer at Maggiano, DiGirolamo & Lizzi, P.C. by calling (201) 585-9111 or emailing us. We are relentlessly devoted to helping the injured, and we are ready to start helping you. Aggressive advocacy – Our versatile, uniquely experienced trial attorneys can out-fight and out-smart the opposition. The highest quality legal services personalized to your claim – We treat each case uniquely; we customize our representation to fit the specifics of a claim; and we use the latest technology and tools to craft the strongest possible cases. Respect, compassion and honesty – Our lawyers take the time to learn everything about you and your claim so that we can stand in your shoes and effectively present your case. Year after year, our record of success and superior legal service earns us professional awards, honors and accolades, as well as positive testimonials from previous clients. Located in Hudson County, New Jersey, Hoboken is a vibrant, growing city that is home to more than 50,000 residents. Hoboken, nicknamed “The Mile Square City,” is a riverfront city that is a part of the New York metropolitan area. While the city was built on a reputation of being a “blue collar” town, in recent years, Hoboken has come to be known for its upscale housing and retail centers. In addition to its picturesque parks, like Columbus Park and Stevens Park, Hoboken is also home to a number of arts and cultural festivals, like the Hoboken International Film Festival and the Shakespeare Festival, as well as various educational institutions, like the Stevens Institute of Technology. In popular cultural, Hoboken is known for being the birthplace of Frank Sinatra, the setting for the film On the Waterfront and the setting for the reality show Cake Boss.